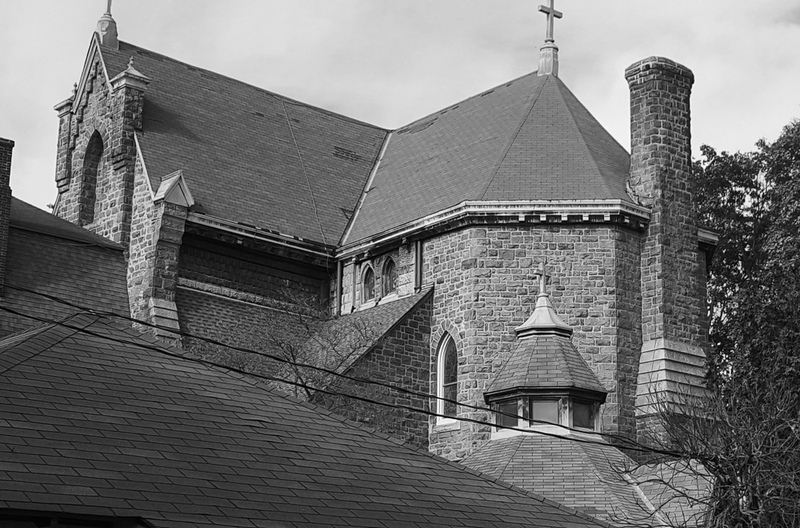 "Welcoming, charitable, and empowered to live the Gospel"
Our beloved 120-year-old church is in desperate need of some loving care, specifically the roof. After years of patchwork and repairs, it is necessary to fully replace the Roof, in addition to some exterior maintenance on the stonework and windows. In December, the first three pews on the left side of the church were cordoned off due to falling plaster. Over Christmas we had water leaking close to the crèche. We, the Legacy / Roof Committee, are excited and relieved that work has now begun. The scaffolding crew began their work on Wednesday, March 20. March 20 on the railroad side of the church. The estimated cost of this project totals $1.325 million. We are glad to report that we have raised 60% of the funds. For the past five years, parish leadership has judiciously put aside donations from our annual appeals for this project. These donations, along with other special gifts and bequests, have allowed us to accumulate approximately $780 thousand towards the repair work. While we are extremely grateful to all who have generously contributed, we are now ready to kick off the final stretch of the Campaign. We are calling it the “Legacy Campaign.” Here’s why: It is our stewardship and legacy to future generations of parishioners who will worship and celebrate numerous family milestones in this gorgeous, spiritual space. The beauty of our 120-year-old Church comes with significant maintenance requirements. Fr. Liam has assembled a committee to address the fund-raising aspects of this Legacy campaign. We are committed to assuring both the success of the Roof Project, and the future Legacy our Church. We invite you all to join in contributing to this effort. No donation is too small. We are a parish of 850 families, our goal is to have 100% participation. Every family participates as an act of stewardship toward our continued success — Think of our beloved church as our spiritual home, a time-honored space in which we proudly celebrate everything from daily Mass to major family milestones. We also invite former parishioners and friends from outside the parish to join us in this effort as well. Our hearts have been warmed with gratitude for those who have already generously contributed. Thank you for your generosity and support as we embark on this vitally important journey of stewardship of our beloved church and parish community. God bless you and your families. For an Estimated Breakdown of Project Costs, click here. For Suggested Methods for Donations, click here.